Harold Lucas and Billy Mitchell immediately put together another Clovers group, whose other members were tenor James "Toy" Walton and bass Robert Russell (both of whom had backed up Billy, on Poplar, as part of the Bachelors). On October 10, 1961, they returned to the Atlantic Studios to lay down the final four tracks for the company that took them from the top to the bottom. They recorded "The Bootie Green," "Salty Tears," "Travel On," and "Drive It Home," with Billy Mitchell leading all of them. "The Bootie Green" and "Drive It Home" were released in December 1961. "Bootie Green," in various spellings is a term that had been around for years. In 1950, Tiny Bradshaw released a nonsense song called "Boodie Green" on the King label. The Treniers had a version on Epic, in April of 1956. Finally, the Olympics had recorded "Boo-Dee Green" for Arvee in 1960. 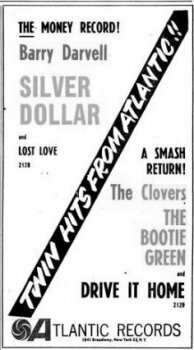 The Clovers' "Bootie Green" was an attempt to cash in on the twist craze: its lyrics claimed it was "something like the twist." It sounds as raunchy as the Midnighters' "The Twist" was (on Vee-Jay), before Hank Ballard toned it down (on King). "Drive It Home" was a remake of Hal Paige's 1953 Atlantic offering. I'm told it's a thinly-disguised off-color piece with a car theme ("we give it the number one/drive it home"); I really can't make much out of the lyrics at all. The best I can say about it is that it's got nice piano work. Regardless, it couldn't compete against "Peppermint Twist," "Moon River," "The Lion Sleeps Tonight," "The Wanderer," and "Duke Of Earl." On February 23, 1962, this Clovers group appeared at the Apollo, on the Hal Jackson Oldies Show. The other acts were: the Cadillacs, the Hollywood Flames, the Imperials, the Charts, Charlie & Ray, the Kodoks, the Turbans, Tiny Topsy, and the Reuben Phillips Orchestra. A 1962 Winley release, by "The Fabulous Clovers featuring John 'Buddy' Bailey," was "Be My Baby" (featuring a flute), backed with "They're Rockin' Down The Street" ("twistin' to the beat" - the melody is very like Chuck Berry's "Almost Grown"). Later that year, Winley issued "Gotta Quit You" (an uptempo tune, with Bailey showing some grit in his voice), coupled with "I Need You Now" (a nice early-60s ballad). 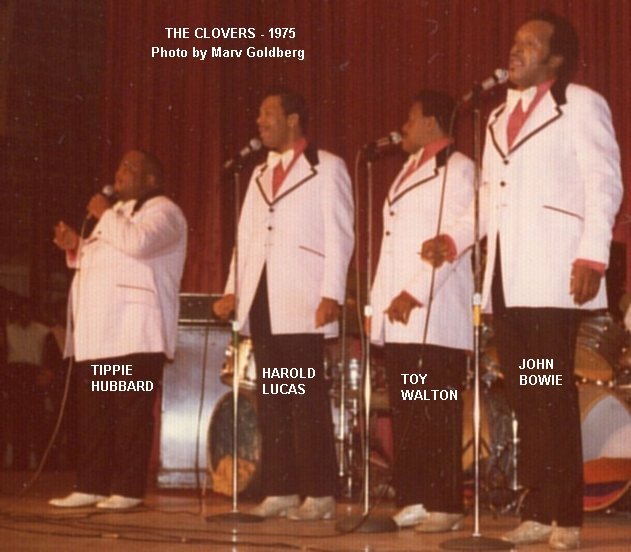 These two sides were billed as "The Clovers featuring John Buddy Bailey." While Buddy was the lead on all of these, the rest of the group is unknown. Also in 1962, Billy Mitchell left. He did some solo work around the D.C. area for a while and would occasionally sing with any Clovers group that played there. He was replaced by Roosevelt "Tippie" Hubbard, who had recorded "Our Winter Romance" and "Nobody" (as "Tippy Hubbard" on Frandy #607 around January 1961). There's a group on both sides; is it the Clovers? If so, they're only backing him, since he didn't become a member until the following year. However, all the singers involved are now deceased, so we may never know. The Lucas group went to the Stenton label (as "Tippie and the Clovermen"), where they did a very pretty version of "Please Mr. Sun." It was backed by "Gimme, Gimme, Gimme," which was a faster version of the Spaniels' "I Like It Like That" (suddenly written by "Tippie & the Clovermen"). Also done at the session was a really pretty tune called "Our Winter Romance." Later in 1962, "Tippie and the Clovers" recorded for the Tiger label (a subsidiary of Rust Records). Trying to cash in on the bossa nova craze, they recorded two Leiber & Stoller creations: "Bossa Nova, Baby" and "The Bossa Nova (My Heart Said)" (the latter credited to Barry Mann and Cynthia Weil, as well as Leiber and Stoller). Released in November 1962, this is the same "Bossa Nova, Baby" that Elvis Presley did, and, in fact, was issued before his version. The instrumentation is excellent (both sides), but a bit fast for a bossa nova. "The Bossa Nova" (not bad, but wrong for the Clovers) has the lyrics: "what can you lose, you got feet, you got shoes," which are similar to lyrics in an unreleased Drifters tune from December 1963, called "Beautiful Music"; it's possible that Mann and Weil worked on that too. 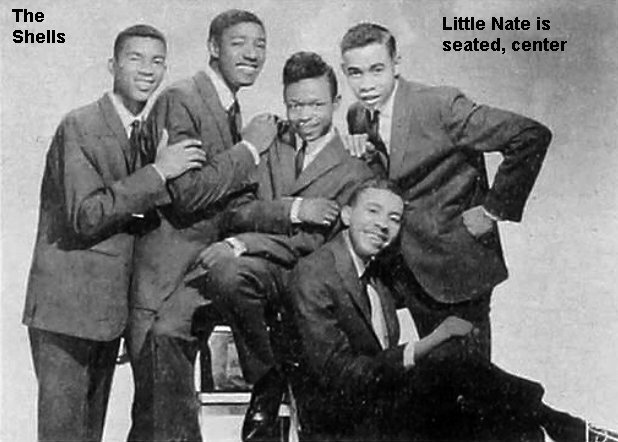 This group then switched over to Brunswick, where they recorded "The Kickapoo" (a dance record, partially written by Jackie Wilson), backed with a remake of "Love! Love! Love!" There was no reason for the childish lyrics of "Love! Love! Love!" to be recorded in the 60s; it even has the Dread Chorus. These were released in September 1963. All the Stenton, Tiger, and Brunswick tunes were led by Tippie Hubbard. Meanwhile, in 1963, a Bailey group recorded for another of Paul Winley's labels, Porwin (which he owned with Record Shack's Eddie Portnoy). The "Clovers" on these sides were tenor Nathaniel "Little Nate" Bouknight, former lead of the Shells, Peggy Winley Mills (Harold and Paul's sister), and Ann Winley (Paul's wife). There's a chance that this is the same group that recorded the two 1962 Winley releases. The first of their two Porwin records (credited to "The Clovers, Featuring Buddy Bailey") was released in June 1963: "Stop Pretending," backed with "One More Time (Come On)." "Stop Pretending"(a song that Nate had been practicing with the Shells) was the last Clovers' record that could be said to have charted, topping off at #134 in August. "One More Time (Come On)" has a very early-60s soul sound. The second release (by "Buddy Bailey & The Clovers"), issued later in 1963, was "It's All In The Game" (somewhat tango-ish), coupled with "That's What I Will Be" (a nice ballad). All leads were by Buddy. 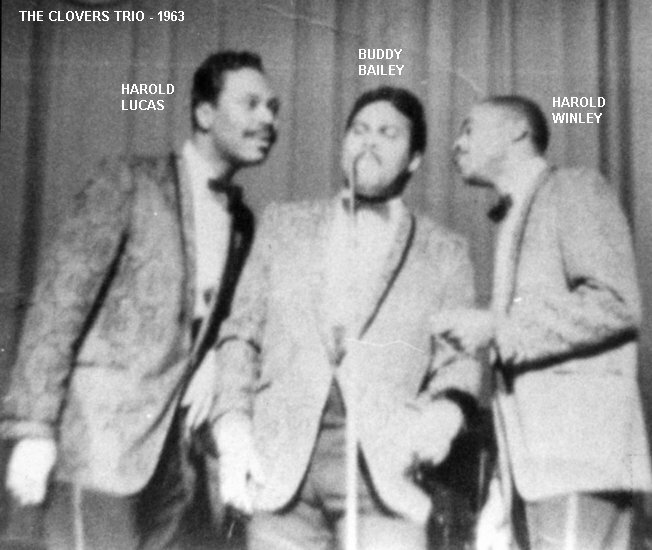 Later in 1963, Buddy Bailey, Harold Lucas, and Harold Winley reunited to form a new Clovers trio (shades of 1946! ); they would remain together for a little over a year. The last mention I could find of Lou Krefetz was in February 1964, when he was named national sales manager for Juggy Murray's Sue Records. In the Fall of 1964, as a reaction to the Searchers' hit remake of "Love Potion Number Nine," Paul Winley leased some old Winley and Porwin masters to Pickwick International. Pickwick released them as an album (on their Grand Prix Series) entitled The Original Love Potion Number Nine By The Clovers. Since the title song was a remake of "Potion" (with Buddy in the lead and tambourines behind him), the title of the album was a flat-out lie! Five of the remaining cuts had previously been on singles: "I Need You," "Gotta Quit You," "They're Rockin'," and "Let Me Hold You" had all been issued on Winley (a couple with slightly different titles); "That's What I Will Be" was a Porwin cut. The rest of the album consisted of: "Pen And Tablet," "Please Don't Mess With Me," "Out Here," and "T.V. Fanatic," which had either been recorded for Winley or Porwin, but never released. Some of these were bland and some were kind of semi-Soul. As a whole, it sounds like the LP was thrown together over a weekend. 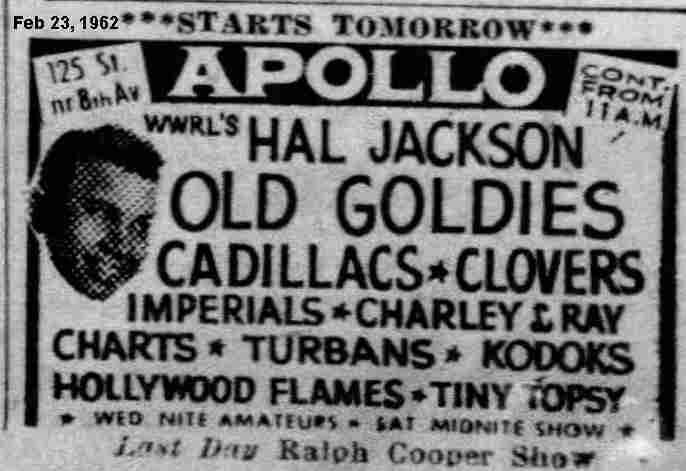 The week beginning January 1, 1965, brought an "Old Goldies" show to the Apollo Theater and the Clovers trio (Bailey, Lucas, and Winley) was present. The other acts were: Sonny Til & Orioles, the 5 Keys, the Solitaires, the Bobbettes, Charlie & Ray, the Hollywood Flames, Screamin' Jay Hawkins, Jackie & Starlights, and Paul Winley (as MC). Harold Winley decided to call it quits after this show. ("I was in school, competing with my kids for As and Bs.") Bailey and Lucas stayed together long enough to record some sides for their ex-boss at Atlantic, Herb Abramson. Herb had been doing independent production work, and they recorded "He Sure Could Hypnotize" and "Poor Baby" for him on April 8, 1965. The others on the session were tenor Jimmy Taylor and bass Robert Russell. These sides were then sold to the Port label (part of Jay-Gee Records and run by Jerry Blaine's son, Steve), where they quickly faded from sight. "He Sure Could Hypnotize" has a distinct Coasters-type sound, and "Poor Baby" is more in a Soul vein. Soon, Bailey and Lucas had parted company for the last time. Bailey got together a new group (members unknown), which recorded for Lana later in 1965, turning out updated versions of "Love Potion No. 9" and "Devil Or Angel." This was one of these "It Shouldn't Have Been Done" sessions, which could only invite comparison with the originals. They even "fixed" the lyrics: where once he "kissed a cop," now it was "when I kissed a girl." Harold Lucas and Robert Russell got back with Roosevelt "Tippie" Hubbard and James "Toy" Walton to record a session for the Shrine label in D.C. (owned by Raynoma Gordy, former wife of Berry Gordy). Al Fox was a fifth voice on the four sides ("Wait Till I Get There," "Let Me Walk Away," "I Wouldn't Mind Crying," and "Bye, Bye") that were recorded under the name "Tippie And The Wisemen." Unreleased at the time, the first three have since surfaced on a couple of Shrine compilation CDs. Soon after these 1966 recordings, the Wisemen became the Clovers again. In 1968, Harold Winley decided to get back into the Clovers business. He put together a group (lead Bobby Adams, tenor Johnny Taylor, and baritone Raymond Loper [formerly of the 5 Keys]). This group recorded two records for the Josie label (the sessions were produced by Bobby Robinson). April saw the release of the Soul sounds "Too Long Without Some Loving" and "For Days." In August, "Try My Lovin' On You" and "Sweet Side Of A Soulful Woman" (with a Drifters-type sound) were issued. Meanwhile, back at the Lucas group, bass Robert Russell had died in 1969, and was replaced by John Bowie, another veteral of the Bachelors. Also, Al Fox had departed somewhere along the way. In October 1975, they (Roosevelt "Tippie" Hubbard, James "Toy" Walton, Harold Lucas, and John Bowie) went contemporary and released a disco recording called "Bump Jive!" on Bill Hancock's D.C.-based Aladdin label. (This was actually a reworking of Johnny Otis' "Willie And The Hand Jive," on a label that was made to look like the original 50s Aladdin [although the colors were pink and black].) Unfortunately, shortly after the recording, Toy Walton passed away. He was replaced first by Andrew Lawyer (who had recently been in the Spaniels), and then by Johnny Mason. (Note that Russell, Bowie, and Walton had all been in the Jets/Bachelors.) Around 1980, Tippie died also (singing with Lucas was getting to be an occupational hazard), and his replacement was Steve Charles. The last time Bailey, Mitchell, McQuater, Lucas, and Winley ever sang together, was in 1988, at a show for the Rhythm And Blues Foundation in Austin, Texas. It was the first time in 25 years that they'd been together. Bill Harris was terminally ill by that time, but his son, Joseph, a bass player, led the band. They sang "Blue Velvet," "Devil Or Angel," and "One Mint Julep." A problem developed because Harold Lucas had brought his own Clovers group along. The solution was to have them come out and sing "Love Potion #9." Others on the show were Bonnie Raitt, Stevie Ray Vaughan, the Thunderbirds, Ruth Brown, and Chuck Jackson. 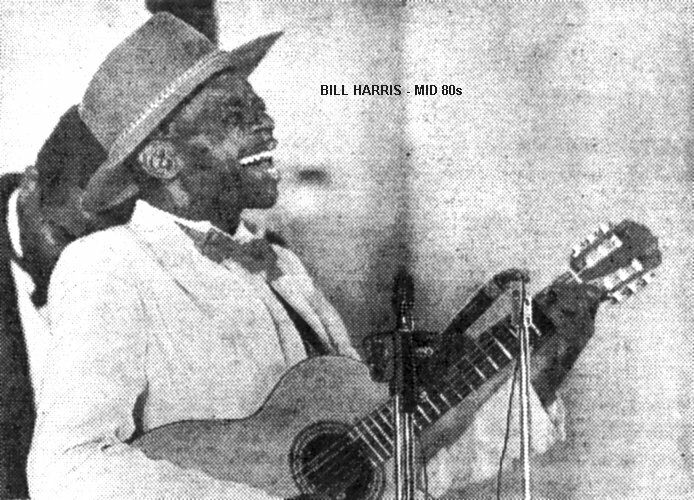 A short while later, in October 1988, there was a benefit concert for Bill Harris. Bill had pancreatic cancer, and the benefit was held to raise money for his medical bills. This time it was Lucas's group that performed. 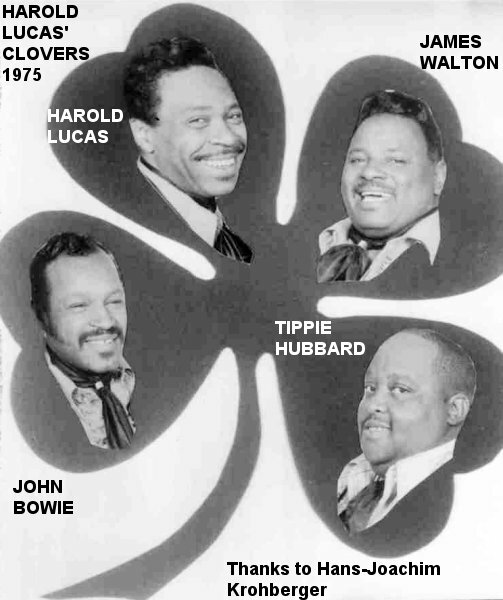 The last known recordings of Harold Lucas' Clovers appeared on the Ripete label of Elliott, South Carolina. The group was now Steve Charles, Johnny Mason, Harold Lucas, and John Bowie. On May 13, 1988, they recorded "Drive It Home" (the last tune that the Clovers had done for Atlantic), and Ben E. King's "Don't Play It No More." These were released that same year. In July 1989, they recorded some more of their old sides: "Blue Velvet," "One Mint Julep," "Lovey Dovey," and "Hey Miss Fannie." The first three were released, in 1989, on a Ripete EP, along with their version of the Falcons' "You're So Fine." By 1990, Chuck Battle had replaced Steve Charles. That same year, "Hey Miss Fannie" was released, along with the newly-recorded "Goin' Home To Jesus." The latter song doesn't have the full group, however. Harold and John were sick in Myrtle Beach, but the studio time was already paid for. Consequently, Johnny Mason and Chuck Battle did the song themselves, with the added voice of Marion Carter, owner of Ripete! There was also a Ripete album that was issued only on tape, around 1989. Called The Clovers: Live At CT's, it contains versions of many of their hits, and does a fine job of showcasing a Lucas group live show. In 1991, the Clovers were inducted into the UGHA Hall Of Fame, along with the Orioles, the Ravens, the Cadillacs, the Heartbeats, the Harptones, and the Teenagers. Both Harold Winley and Buddy Bailey were present to receive their awards. Harold Lucas became ill in 1993 and died the following year. When this was written (in early 1997), the group ("Johnny Mason and the Clovers") consisted of Johnny Mason, Richard Merritt, David Warren, and John Bowie (with Dean Cavanaugh used as a utility fill-in when needed). With many, many personnel changes over the years, the Johnny Mason Clovers are still around in 2009. Both John "Buddy" Bailey and Harold Winley sang with Jimmie Nabbie's Ink Spots over the years (as did Sonny Til), although not at the same time. Harold took over the leadership of the group when Nabbie died in 1992. 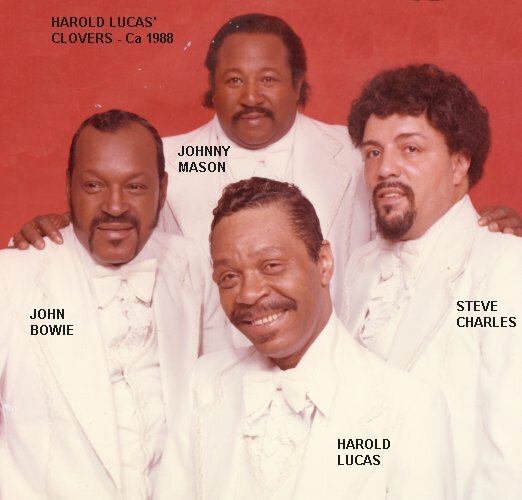 Most of the Clovers are gone now: Bill Harris passed away from cancer in 1988; Harold Lucas died in January 1994; Buddy Bailey a month later. Charlie White is also dead, as is John Phillip, Matthew McQuater, and Lou Krefetz. 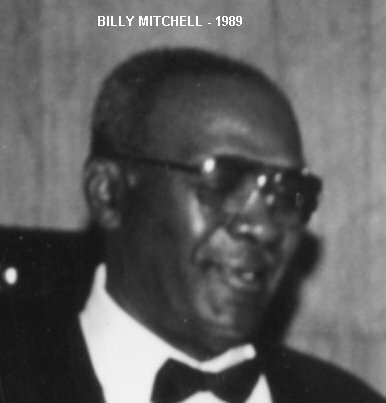 Billy Mitchell lived in D.C., and occasionally joined the Johnny Mason group. He died on November 6, 2002, at the age of 71, after having been in a nursing home for a while. Tippie Hubbard died in April 1985. 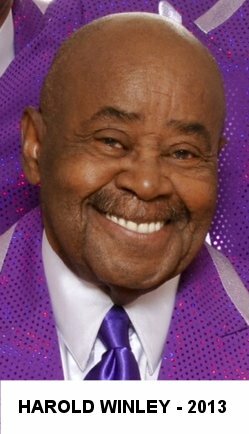 Harold Winley ("I'm the only one still standing") carried on Jimmie Nabbie's Ink Spots (with the Swallows' Herman "Junior" Denby on lead, as of mid-2001) until 2009 when he became part of "The Original Clovers, Featuring Harold Winley." He's still alive in August 2018. And that's the story of the Clovers, certainly one of the most popular groups in the history of R&B. Harold Lucas was right back in 1946; it was a lucky name! Special thanks to Ronnie Italiano, George Moonoogian, Dave Hinckley, Jeff Beckman, Chris Buccola, Victor Pearlin, Nikki Gustafson, Paul Webb, and Chris Beachley. Ads are, of course, from various volumes of Galen Gart's First Pressings series. Discographical information was cheerfully plundered from Ferdie Gonzalez' Disco-File. *** NOTE: This song is by Billy Mitchell, backed up by the Bachelors.